At Yuluma we have a vibrant and active music program. Opportunities are provided throughout each year for children to participate in performances within the school and in the wider community. All classes from Pre-primary – 6 participate in sixty minutes of class music per week. Students are given instruction and learning opportunities to develop their musical skills. Activities also encourage creativity, problem-solving skills, healthy self-esteem, the ability to work together as part of a team, to set goals and take risks to achieve them. Students develop interpersonal skills, oral language skills, spatial awareness, and respect for themselves and others. All these skills are transferable to other learning areas such as Mathematics, Science and English, and have been shown to improve student outcomes. School assemblies are held throughout the year, parents are invited to attend. All assemblies have a music component, which may be a community song (a song learned by all classes and sung at the assembly as a whole school), a class item, an instrumental performance or a group choral performance. Through the Department of Education’s School of Instrumental Music, students may be offered the chance to learn clarinet or classical guitar in years 5 and 6. These students are then well-placed to apply for entry to music programs at high schools such as Churchlands, Carine, Perth Modern School and Shenton College among others. In Years Pre-primary -3, the emphasis is on participation and enjoyment. Students take part in singing and movement to music, and play percussion instruments. They gain confidence by performing first in groups for their class, then individually, and may also take part in assembly performances by the end of the year. By Year 3, children are learning to read music and playing tuned instruments (xylophones). In Years 4 and 5, skills are further developed through learning the recorder. Children may progress to play in class ensembles and at assemblies. Year 6 students continue to develop their skills on the recorder and tuned percussion. Senior students also have a focus on music technology, using a variety of software to create their own compositions and explore the creation of lyrics and movement. This group includes students in Years 4 – 6 who have an interest in, and an aptitude for music. It fulfills the role of a formal school choir, and also undertakes instrumental activities as negotiated between the teacher and students, such as taiko drumming and the ukelele. The purpose of the program is to encourage children to extend musical abilities beyond what is able to be achieved in class, and provide meaningful performance opportunities. 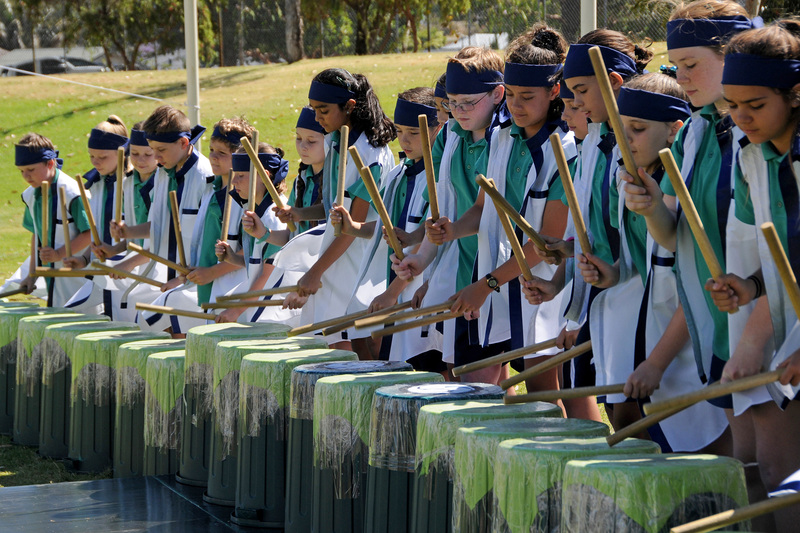 PEP members have taken part in school assemblies, school concerts, and have performed in a variety of venues such as Crown Theatre Burswood, Perth Arena, Joondalup Arena, Perth Concert Hall and Winthrop Hall at UWA. We are extremely fortunate at Yuluma to be a part of the Education Department’s Instrumental Music Program. This program is run by Instrumental Music School Services (IMSS) and offers free tuition to hundreds of students throughout the state. It is a highly competitive program which is designed to prepare students to continue learning their instruments in high school. Students in Year 5 may be offered the chance to learn either the clarinet or classical guitar. There are only 5 places available for each instrument. At the end of Year 4, all students sit a musical aptitude test. Places are offered to students based on the following criteria: performance in the test; attitude and ability displayed in music classes; parental support; and general academic ability. Q. Can my child learn an instrument prior to Year 5? A. They can learn an instrument privately, however currently there are no private classes offered at Yuluma. Q. Will it help my child get in to the Instrumental Program if they start learning privately beforehand? A. No, and in fact IMSS teachers will only accept beginners. Q. My child has been offered a place but not for his first choice of instrument. What should we do? A. This happens frequently, because there are only 5 places available for each instrument. There is no obligation to accept an instrument. Some points to consider: This is an excellent program which supports students’ music learning and prepares them to continue their music studies in high school. Your child has been selected because they have an aptitude for music, and would benefit from developing this talent. Many children grow to love their instrument even if it is not their first choice. Children who study music in high school find themselves in a supportive and highly motivated peer group which is an excellent foundation for their education, whether or not they continue their music studies after high school. Music develops skills that are applicable in all subject areas, and music students are often successful in gaining entry to academic extension programs in high school. Q. Why aren’t more instruments available to learn at Yuluma? A. The numbers of instruments offered depends on the size of the school. Most schools of our size only offer one instrument. The choice of instruments is set by the local high school, which needs to have a balance of instruments when students enrol in Year 7. For example, clarinets are highly desirable for inclusion in concert bands, orchestras and jazz ensembles. Q. Will my child be able to learn an instrument in high school if they learn privately in primary school? A. Most state high schools (including Churchlands) will only accept music students who have been learning through the Education Department. For further information contact your local high school. Q.Will my child still be able to learn an instrument in high school if they are not offered an instrument in primary school? A. Not usually, although it depends on the high school. Once again, contact your local high school.